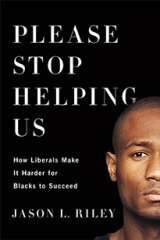 Ever since it was published in June, Jason L. Riley's "Please Stop Helping Us: How Liberals Make It Harder for Blacks to Succeed" (Encounter Books, 184 pages, index, $23.99) has been attacked by the liberal establishment and black talking heads who continue to deliver the "It's not our fault, it's white racism" argument as an explanation for lack of progress for African-Americans. They pour boiling oil on Bill Cosby, Thomas Sowell, Jason Riley and others who call for an end to destructive black culture that despises intellectual activity and celebrates the gansta hip-hop culture. At the end of this review, I'm including a HuffPost Live interview of Riley; I'm doing this to make this review as fair and balanced as possible. I say this as I state without reservation that I'm 100 percent with Riley, who has also been attacked because he's married to a white woman, New York Post columnist Naomi Shaefer-Riley. I haven't seen similar attacks on New York City Mayor Bill de Blasio, who's married to an African-American. I've often wondered about liberals -- including Presidents Bill Clinton and Barack Obama -- extolling the benefits of inner city public education -- while sending their own children to private schools like Sidwell-Friends in Washington, DC. Riley makes this point, too, in arguing for more education choices for urban African-American parents and their children. African-Americans deserve as many choices as affluent liberals who tell blacks to support public schools and then send their kids to expensive private schools, Riley argues. He tackles the argument -- made by liberals who support teachers' unions because the teachers' unions -- both the AFL-CIO one, the American Federation of Teachers (AFT), and the National Education Association (NEA) -- support Democratic candidates -- that charter schools and voucher programs harm the traditional public schools that most minority and low-income students attend. This argument says that charter schools and voucher programs siphon off from public schools the best and the brightest. Riley says that most inner city schools are staffed by union members who care more about job security than educating their students. What about other unions? Riley gives his readers a historical look at unions and how the traditional AFL craft unions refused to admit blacks and came up with minimum-wage laws and legislation like the 1931 Davis-Bacon Act (http://en.wikipedia.org/wiki/Davis–Bacon_Act) that was originally intended to prevent the employment of cheaper non-union African-American workers from the South. What about affirmative action programs? Don't they help blacks? No, says Riley, who says that well-intentioned affirmative action programs for higher education designed to address past discrimination actually result in mismatching black students to highly selective schools like the University of California-Berkeley, where they are destined to fail because of the poor education they received in inner-city public schools. The result is fewer black college graduates than would otherwise exist. Too, he writes, affirmative action isn't working in highly selective public universities because Asian-American students outperform whites, blacks and Hispanic students. "I got there and immediately found I could read better than anyone in the school. My father's example and my mother's training had made that come easy. I could pick up a book, read it out loud, pronounce the words with proper inflection and actually know what they meant. When the nuns found this out they paid me a lot of attention…when the kids found this out, I became a target." Riley describes how, when living in his hometown of Buffalo, NY and living and working in the DC area, he was profiled by police. He says he understands the profiling, because of the overwhelming disproportionality of blacks committing crimes. He says that abolishing stop-and-frisk laws and being soft on crime makes crime-ridden majority black enclaves even more dangerous. To those who believe that Jason Riley is another black mouthing white racist ideology, I say read the book and look at the facts. As the saying goes, "you are entitled to your opinions, but not your facts." Jason L. Riley is an editorial board member of the Wall Street Journal, where he has worked since 1994, and a Fox News contributor. He lives in suburban New York City with his wife, New York Post columnist Naomi Schaefer-Riley, and their three children.